How does the implantation of an artificial wrist joint actually get carried out? Where can one see the extensor tendons which are normally located right above the wrist joint? The procedure requires the application of an approximately ten centimeter long cut on the extensor side of the wrist to display the wrist joint and allow for the removal of those carpal bones opposite the radius. 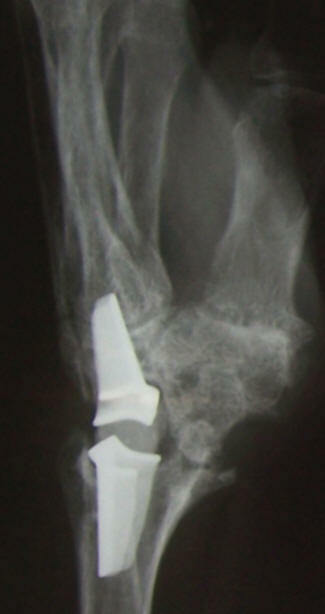 Once these carpal bones have been removed there is room for the artificial wrist joint. The replacement joint is for once fixated to the radius as well as to the metacarpus. Placing a wrist joint prosthesis. The image shows the artificially created cavity within the radius (arrow). 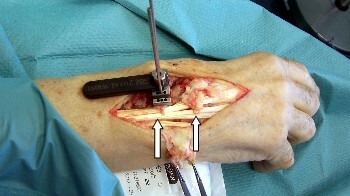 The shaft of the artificial wrist joint is placed into this cavity. After creating the bone cavity each part of the artificial joint is placed and fixated into the appropriate position. Details on the procedures may vary based on the utilized type of prosthesis. Keeping the extensor tendons running above the wrist joint aside for the implantation procedure (artificial wrist joint). The extensor tendons are kept aside during the implantation procedure (arrow). Once the artificial joint has been successfully implanted, the extensor tendons are repositioned into their natural position. Are there different types of prostheses? Yes, there has been a pleasing development in the area of wrist joint prosthetics. The first models made from Silastic where already available in the late eighties and early nineties. Their durability however was not very long. Artificial wrist joint made from Silastic according to Swanson. The image shows an artificial wrist joint made from Silastic. The actual joint cannot really be made out in the x-ray. The metal rings help preventing the wrist joint prosthesis from sliding into the bone or from getting damaged by sharp bone edges.